According to the U.S. Energy Information Administration (EIA) between 2006 and 2011, domestic coal consumption has decreased by about 10 percent but coal exports have more than doubled. Consumption isn’t the only thing that’s down, so is production. What that means is that for a number of reasons — including Massey Energy’s Upper Big Branch Mine disaster which killed 29 miners less than three years ago — conventional deep well mining in on the decline. Consequently, surface mining aka mountain top removal is up, amounting to nearly 50% of the total coal extracted. It also means that while Americans turn to cleaner energy sources, the coal companies have ratcheted up the export of Appalachian mountains. And coal company revenues? They’re up too. In the same time period that production’s gone down, 2006 to 2011, big coal has netted $8.4 billion in profits. And that’s after paying millions to CEO’s and puny fines for safety violations. If you’ve never been to West Virginia, it’s hard to imagine the topography. This might help. If you have an egg carton in your fridge, take it out and turn it over. Those mountains in West Virginia are just like the peaks you see which hold the eggs and there are deep ravines in between each peak just like the spaces between the egg chambers. Now imagine that rather than carefully opening the box from underneath and removing an egg, you just stuck a fire cracker into the peak and blew the chamber that holds it to smithereens. Then just pick the eggshells out and pile them in the space next to where the egg and egg housing used to be. 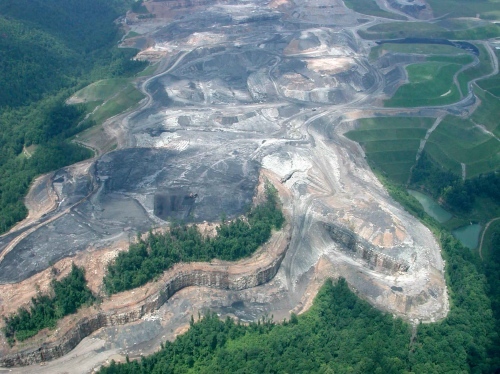 In mountaintop removal that’s just what happens. When ordinance and massive earth movers get done, the peaks are gone and debris clogs the ravines in between them. That’s where the water which runs off a mountain — something lay people call a river — used to run. After a surface mining operation, all those waters get clogged and the chemically laden toxic run off collects in slurry ponds. Former river beds collect more than just rock. The ravines also collect plant life like trees, flowers, berry bushes and wildlife like chipmunks, rabbits, birds, and whatever else might have been living on the mountain at the time it’s exploded. Additionally, and every so often, mountains contain dead things that get atomized as well — like dearly departed West Virginians. Now the coal companies have taken very little flack for blowing up grave yards, but they have taken some. So there are accounts of different companies’ attempts at preserving burial grounds while they shatter everything around them. This week and for some time in Logan County — home of the famous Hatfields of feuding Hatfield and McCoy fame — the roadside’s lined with tomb stones that once marked mountain top graves. Turning from deep well mining to mountaintop removal mining or surface mining isn’t just environmentally cataclysmic; it’s devastating to the cultural heritage of West Virginia. 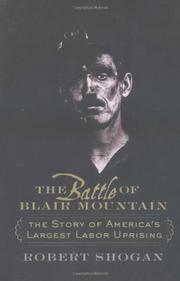 It robs people of their livelihoods: 130,000 coal miners worked in the mines in the 1930s, 17,000 coal jobs exist today. Mountaintop removal robs them of their topography: more than 500 mountains have been removed from Appalachian vistas since the practice began. And it robs communities of their human history, their graveyards, their past. Jesse Johnson, perennial Mountain Party candidate for governor of West Virginia, believes that’s by design. “If they can wipe out our jobs and people leave to find work. If they tear down or burn to the ground the homes abandoned by those who went away and if they can wipe our cultural past off the hillside by destroying the graves of our grandparents, it’ll be that much easier to wipe out the history of the labor movement.” Johnson continued, “And if the Mingo Logan Coal Company,” which is the name on the sign last week that barred the way up Blair Mountain, “has their way, they’ll wipe West Virginia labor history off the map as well.” Johnson doesn’t believe the coal companies want miners to remember that they used to fight back. The increased profitability that mountaintop removal has brought the coal companies is not being shared by the residents who pay for it with their mountains, their water ways, and their past. West Virginia’s unemployment and poverty rates are much higher than the national average. And a higher percentage of West Virginians need government assistance: 346,833 currently use food stamps costing federal taxpayers $500 million dollars per year. Of course that pales by comparison to the federal taxpayer moneys going to the handful of coal companies. No, they don’t get food stamps, but they’ve received more than $30 billion dollars in subsidies since 2003. And Johnson says big coal is using that money against the people and resources thereby destroying West Virginia’s “Wild and Wonderful” way of life.